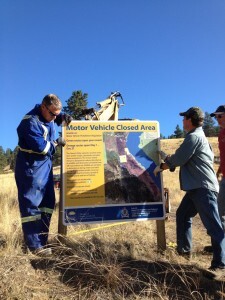 In late September, volunteers from the Summerland Sportsmen’s Association worked alongside the Conservation Officer Service and SOSCP in Garnet Valley north of Summerland, posting signs and deactivating illegal trails. The project, partly funded by the Habitat Conservation Trust Foundation Public Conservation Assistance Fund, was initiated by the Province of BC Fish and Wildlife and COs in support of new Wildlife Act Motor Vehicle Prohibition Regulations. Garnet Valley has some of the Okanagan’s’ most valuable wildlife habitat – including south facing slopes which are ideal winter and early spring habitat for mule deer. Garnet Valley is home to conservation lands that were purchased by the Province for their extremely important value to wildlife. The valley contains sensitive wetlands, grasslands and open forests, and is a link for wildlife to connect to other important natural areas away from the Hwy 97 corridor. Motorized vehicles cause disturbance to wildlife and have degraded habitat in Garnet due to illegal trail building. The new regulations for Garnet Valley designate open, legal routes and close illegal routes to protect wildlife and allow habitat to recover. “The success of the Ritchie Lake fencing project and the recovery of that wetland has inspired all of us, the sportsmen’s club, the conservation partnership and the provincial government to keep working for habitat recovery in the Garnet”, said Bryn White, SOSCP Program Manager. Violations and fines will be imposed for those who travel off the designated routes, and individuals who cause significant damage to the environment can be subject to penalties under the Forests and Range Practices Act. Anyone can report illegal activities and environmental damage by calling the RAPP line 1-877-952-RAPP (7277).